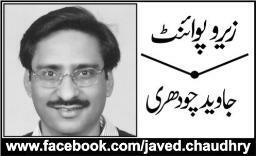 The reading of Javed Chaudhry’s op-ed ‘Beech Ka Rasta’ (The Middle Way), printed in the February 4thUrdu newspaper Daily Express, made me realize that the media in general and the Urdu press in particular is so much bent on molding the public opinion that it don’t hesitate to resort to any unethical means including the misrepresentation of facts to achieve its hideous aims. The Lahore shooting cannot be justified but the way the media is playing out the entire episode is repulsive. In his op-ed Javed Chaudhry vehemently builds up the case against Raymond Davis by quoting certain past diplomatic criminal instances. He begins by writing about the 1984 incident of Libyan embassy in London. In that case, one of the Libyan embassy officials was involved in the killing of a British female police officer. The accuracy of those facts can’t be contradicted as it is known when the British demanded the handing over of the official, Libya refused and this ultimately led to the severing of the diplomatic relations between the two countries. No one from the Libyan embassy was ever prosecuted. Next, Javed Chaudhry writes about one of the widely quoted diplomatic crimes committed by the foreign diplomat in Washington DC. On January 4th 1997, Georgia’s Second-in-Command diplomat killed a 16-year-old girl during driving, while the other four people sustain injuries. Washington police arrested the diplomat, Georgian president requested the diplomatic immunity from the President Clinton but the president refused the request. This case involved the Republic of Georgia’s Second-in-Command diplomat, Gueorgui Makharadze, killing a sixteen-year-old girl and injuring four others in a car crash. In the aftermath of an accident, the US asked the Georgian government to waive the diplomatic immunitywhich the Georgia refused initially and Makharadze was ordered to return home. A week or so later, the Georgian President waived the immunity and allowed Makharadze to be prosecuted. There had been unconfirmed reports of Senator Judd Gregg, threatening to revoke the aid payments to Georgia if it didn’t waive the immunity. That was a mere threat, suppose if there was any truth to this report of threat even then the US would have not been able to prosecute Makharadze unless and until his immunity had been waived by the Georgia. In other words, Georgia would have ignored the threat and had recalled Makharadze. Chaudhry is totally wrong to say in his op-ed that Georgian President claimed immunity for Makharadze but the President Clinton refused. There is no truth to Chaudhry’s claim either that Makharadze was arrested. The investigators didn’t conduct the blood alcohol test after the crash on Makharadze since he was identified as a diplomat. Makharadze was imprisoned to 7-21 years only after he pleaded guilty to one account of involuntary manslaughter and four accounts of aggravated assault. However, after three years Makharadze was transferred from the US to Georgia under the Council of Europe Convention on the Transfer of Sentenced Persons Treaty. Makharadze served two more years in prison in Georgia before he was released on parole. Chaudhry continues distortion of facts and says that as retaliation in 1999 when an American ‘diplomat’, Loren Wille, got involved in a car crash killing a translator Georgia refused to accept his immunity and sentenced him to 10 years in prison. First of all 54-year-old, Loren Wille was not a ‘diplomat’ as Chaudhry claims. He was instead a Catholic Relief Services worker. Yes, he was only a social worker. Second, he never ran over the translator as mentioned by Chaudhry. The translator, a woman called Manana Tsomashvili, was in fact traveling in Loren’s car and the accident occurred due to bad weather. The prosecutors failed to prove over-speeding besides, the passenger didn’t buckle up either despite Loren’s insistence. Chaudhry says, the US President claimed diplomatic immunity for Loren. What diplomatic immunity when Loren had nothing to do with diplomatic mission at all. Loren was released after five months. Chaudhry so blindly copy and pasted material that he failed to figure out whether the slain translator was a man or a woman; whether Loren was a diplomat or his case got America’s attention only because he was a US citizen. Under the doctrine of State Responsibility it is common for states to get in touch with their citizens abroad when they get into legal trouble. Lastly, Chaudhry discusses the case of Pakistan’s ambassador to UN, Munir Akram saying that he was arrested by the police. Pakistan invoked diplomatic immunity but the US refused to accept it. In 2003, Akram’s girl friend, Marijana Mihic called up 911 after a brawl with Akram. The police arrived but upon discovering that Akram was protected by diplomatic immunity, returned. In the wake of misdemeanor charges against Akram, the US asked Pakistan to waive Akram’s immunity. Pakistan didn’t waive immunity instead Akram was recalled. There was no arrest made as Chaudhry falsely claims in his op-ed. Instead of playing to the gallery, I hope the next time when Chaudhry makes such claims; he’ll bother to do a little bit of research rather thancopy and pasting (or translating) erroneous reports from different news sources.